Come out to North Beach for a great night of cocktails and laughter. Every Monday, The HellaFunny Comedy Collective will hand-select six of San Francisco’s Best Comedians to rock the mic. 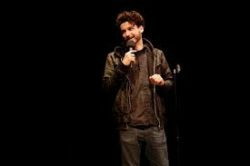 Comedians performing at this show have been seen on Comedy Central, ABC, NBC, SF Sketchfest and more… Hosted by Tim Young of HellaFunny.